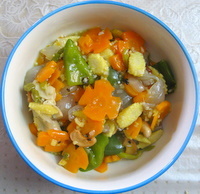 Stir fry vegetables is a very simple, yet flavorsome recipe. I love the Chinese Stir fry method. This way the veggies remain crunchy as well as retain most of their nutrients. If you use a lot of ginger and garlic in your daily cooking, you will love this recipes. This recipe is a dry one but if you add more water and then thicken the sauce with cornflour, it can be used as the white sauce served with Chinese chop suey, to go with the crispy noodles. Add any more vegetables of your choice. There is no hard and fast recipe for vegetables stir fry, you can add any vegetables of your choice, for example here is another vegetables stir fry which is totally different from this recipe. Meat lovers can add the choice of meat to the recipe. Chicken goes best I think. Heat oil in a wok and fry the cashew nuts till light brown in color. Take them out and keep aside. In the same oil add ginger-garlic, followed by the chilies, celery and onions. Stir fry a little till the onions become little glassy and glossy. Add the carrots now and cook for 2 minutes. Next add the mushrooms and baby corn. Cook till done and lastly add the bell pepper pieces. Add 1/4 cup of water and shake the wok, so that everything mixes well. Add the seasoning and put the cornflour water 1 tsp at a time. As soon as it thickens enough, turn off the heat. Garnish with the cashew nuts. Avoid over cooking these veggies, you should get the crunch when you take a bite. Hmnn yummy! You can eat these stir fry vegetables with boiled rice or noodles. One of my friend eats it just like that like a salad.